In Colorado, all junior tournaments utilize a Points Per Round (PPR) system to determine Colorado rankings. If you're unfamiliar with PPR, it is a very simple process. Players earn points for each win, plus earn bonus points for wins over “Top 20” players. 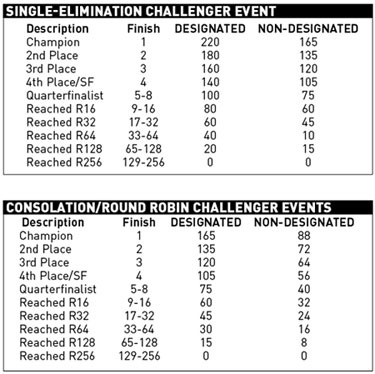 Sanctioned events are broken down to Designated and non-Designated tournaments (see chart below). Designated tournaments carry more points than non-Designated events. Withdrawal: A withdrawal occurs before a player plays any matches in a tournament. The withdrawing player receives no ranking points for the tournament. The player who advances because of a withdrawal shall receive PPR for advancing but no bonus points. Walkover: A walkover occurs after a player completes a match in a tournament and that player is unable to play a subsequent match due to illness, injury or personal emergency. The player receives PPR and bonus points accumulated for reaching the round from which their opponent advances because of the walkover. A player who advances because of a walkover shall receive PPR for advancing, but shall not receive any bonus points. Default (before the first point of a match): A default for lateness at the start of a match, failure to show up for a match, refusal to start match, and misconduct before or between matches. The player receives PPR and bonus points accumulated for the round from which they defaulted, except that players defaulted for code violations under the Point Penalty System (PPS) shall receive no points for the tournament. A player who advances because of a default before the first point in a match shall receive PPR for advancing, but shall not receive any bonus points. Default (after the first point of a match): A default for code violations under the PPS, lateness after a rest period or resumption of a suspended match, refusal to continue to play a match. The defaulting player receives PPR and bonus points accumulated for reaching the round from which they defaulted, except for players who are defaulted for code violations under the PPS shall receive no points for the tournament. A player who advances because of a default after the first point in a match shall receive PPR for advancing and any points that apply to the match. Retirement: A retirement occurs when a player is unable to continue play during a match for reasons of injury, illness or personal emergency. The retiring player receives points per round and bonus points accumulated for reaching the round from which they retire any bonus points that apply to the match. A player who advances because of a retirement shall receive points per round for advancing and any bonus points that apply to the match. Players accumulating a minimum of 150 points during the calendar year will earn a year-end ranking. Only a player's three best results* at Colorado sanctioned events will count towards a ranking. Only a player's top three results will count toward Colorado ranking/standings. If a player has more tournaments on his/her record, the ranking program automatically drops the lower scores and keeps the best results. Rankings/standings points include PPR from the tables PLUS any Bonus Points (for singles only, see table below) earned at the tournament. These Bonus Points are attached to the event in which they are earned. If a tournament is not among the player’s best events, neither the PPR nor the bonus points for that event will count toward the player’s total. Players accumulating a minimum of 200 points during the calendar year will earn a year-end ranking. Only a player's three best results* at Colorado sanctioned events will count towards a ranking. Unlike the Standings lists, year-end rankings points will not count down to the lower age division.